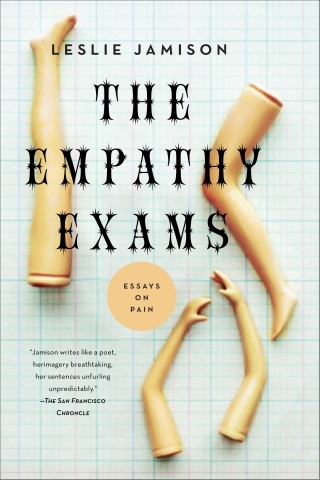 Leslie Jamison’s book of essays, called The Empathy Exams, has a lot to say to about the reaches (and limits) of human love and compassion in their modern expression. The second essay in the collection, called “Devil’s Bait,” is about a group of sufferers who share a rare, controversial illness called Morgellons Disease. With Morgellons, strange fibers grow beneath the skin, causing the sensation that the skin is crawling. The term is formication—the sensation of crawling insects under the skin. Jamison tells the story well. The reader, going along with her to a Morgellons conference in Austin, Texas, has a hard time deciding what to think about the scientific reality of the illness; at the same time, the reader feels a growing sense of paranoia about a growing itch in their own heads. Whichever way, though, you get a larger sense of what empathy means in a world where everyone finds you crazy. The notion that Morgellons patients might be “making it up” is more complicated than it seems. It could mean anything from intentional fabrication to an itch that’s gotten out of hand. Itching is powerful: the impulse that tells someone to scratch lights up the same neural pathways as chemical addiction. In a New Yorker article titled “The Itch”—like a creature out of sci-fi—Atul Gawande tells the story of a Massachusetts woman with a chronic scalp itch who eventually scratched right into her own brain, and a man who killed himself in the night by scratching into his carotid artery. There was no discernible condition underneath their itches; no way to determine if these itches had begun in their skin or in their minds. It’s not clear that itches can even be parsed in these terms. Itching that starts in the mind feels just like itching on the skin—no less real, no more fabricated—and it can begin with something as simple as a thought. It can begin with reading a paragraph just like this one. Itching is a feedback loop that testifies to the possibility of symptoms that dwell in a charged and uneasy space between body and mind. I’ve come to understand that the distinction made here between “real” and “unreal” doesn’t just signify physical versus mental but also implies another binary: the difference between suffering produced by a force outside the self or within it. That’s why “self-excoriation” is such a taboo phrase at the conference, and why patients are so deeply offended by any accusation that they’ve planted fibers on their own skin. These explanations place blame back on the patient and suggest not only that the harm inflicted is less legitimate but also that it’s less deserving of compassion or aid. Parasites and bacteria are agents of otherness; easily granted volition as some sinister they or them, and—in holding this power—they restore the self to a victimized state. The insistence upon an external agent of damage implies an imagining of the self as a unified entity, a collection of physical, mental, spiritual components all serving the good of some Gestalt whole—the being itself. When really, the self—at least, as I’ve experienced mine—is much more discordant and self-sabotaging, neither fully integrated nor consistently serving its own good. Not only is Jamison pointing out the elusive sense of what’s “real” in our own lives (i.e. that, when it comes to suffering, the distinction between what’s “real” empirically and emotionally is fuzzy at best), she is also pointing out that, when it comes to doling out compassion in everyday life, we opt first for litigation. Only after we have found a sufferer innocent to their own misfortune—our respectable Bob Cratchits and innocent Hugo Cabrets—are we then willing to invest our care. We have little empathy to spare for those who actively contribute to their own self-destruction. And yet, as Jamison argues, this is precisely the line on which we find the Morgellons patients. Like the disciples questioning Jesus about the blind man, “Whose fault was this?” the answer allows us to stockpile and safeguard our allotment of compassion. Jesus doesn’t seem to think it is the right question, and neither does Jamison. What does it look like when the self fights itself? When a person is broken into warring factions? Maybe it looks like the cures I see here; scraping or freezing the skin, hitting it with acid or lasers or electricity, scratching the itch or abrading it, taking cocktails of antiparasitic medicines meant for animals three times our size. All these strategies strike me as symptoms of an individual cleaved into conflicting pieces. The abiding American myth of the self-made man comes attached to another article of faith—an insistence, even—that every self-made man can sustain whatever self he has managed to make. A man divided—thwarting or interrupting his own mechanisms of survival—fails to sustain this myth, disrupts our belief in the absolute efficacy of willpower, and in these failures also forfeits his right to our sympathy. Or so the logic goes. But I wonder why this fractured self shouldn’t warrant our compassion just as much as the self besieged? Or maybe even more? Here, in these people who scratch itches that have not been named by science, Jamison portrays a real prerequisite to empathy—a low anthropology. If you were ever able to “be in it” with someone, you would have to deprive yourself of the easy categories of “bad” or “crazy” that so conveniently spout from your mind like chemical defenses when confronting suffering. Instead, you would have to plant those descriptors on the shelf (or else give them to yourself, too) and develop a better imagination for their sake. Empathy, it seems, would be able to give names to the demons inside us all. Thanks for sharing this! I’ve seen the same process in mental illness and substance abuse, which only tend to elicit compassion when they are considered external (eg, owing to genetics or brain chemistry). I never quite identified the ‘why’ behind my sometimes desire to help and sometimes lack thereof. The article helps me articulate that. I am thoughtful about these topics: help for a family with new quadruplets who can afford a nanny (and has one! ), providing a home cooked meal for a sick family when they can afford a personal chef, prison ministry to those who are actually guilty of a crime. Interesting idea. I couldn’t finish reading this article. I became itchy all over and had to stop reading. Now I’m paranoid that I’ll develop Morgellon’s.